my birthday nails had to be fun so i went super bright! 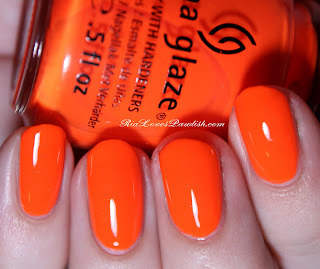 China Glaze Orange Knockout (Neon) is just what its name implies... NEON(!!) orange cream! i'm so in love with it. i used three thick coats but they were super easy to apply and dried fast. it dried matte and ended up looking like a dirty traffic cone, but after two coats of Seche Vite for extra shininess it is became completely scrumptious! one coat Seche Base, three coats OK, finished off with two coats of Seche Vite! Happy birthday Ria!!! Hope you enjoy the rest of the day! Pisces rule!!! LOL. Mine is Monday. Oh, and I love that orange. It would brighten up anyone's day! thank you!! haha Pisces are pretty sweet!